Are you looking for an awesome way to liven up your kid’s next sleepover? 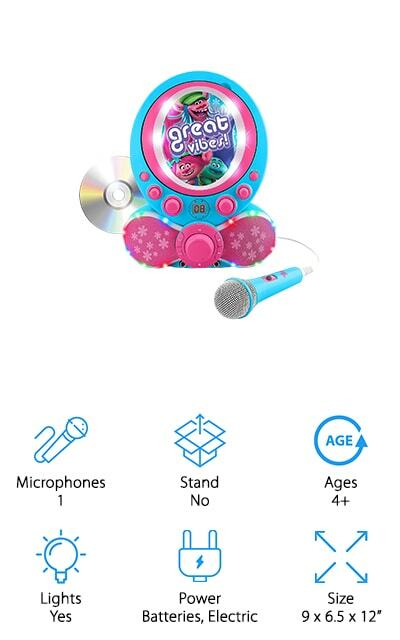 Have you ever thought about buying the best karaoke machine for kids for your home? Well, what are you waiting for? Karaoke is a great way to have a blast while spending family time together. We researched a variety of machines and used the information to put together this karaoke machine buying guide. Before we begin, let’s take a quick look at some of the key features. Microphones: While a lot of these karaoke machines only come with 1 microphone, a lot have a jack for a second one. Out of the items we reviewed, there are a few that come with 2 microphones in the box. Microphone Stand: Is there somewhere to actually clip the microphone? Sometimes this is an actual kid’s version of a mic stand. Other times, it’s a small clip. This isn’t a necessity but it’s really convenient to have. Ages: Most of these are for ages 3 and up. Some of the manufacturer’s say that kids as young as 5 months can use these machines. Which, okay, technically is accurate. But they should only do so under the direct supervision of an adult. Lights: Having lights on your karaoke machine isn’t necessary. But it will take your little performers routine up a notch and make him or her feel like a superstar. So, is it worth it? We think so. Power: Some of these use an AC adaptor, some have batteries. A few give you the option of both. Which is right for you really boils down to whether or not you need a machine that’s portable or not. Size: Keep size in mind as it applies to your child’s height. Older kids will appreciate a machine that’s a little taller because it will be a bit easier for them to use and vice versa. Now that we looked at some of the key features you need to know, let’s move right along into our karaoke machine reviews. If you’re in a hurry, listen up. We put our top and budget picks in the first two spots on our list so they’re easy to find. Start here but stick around if you can. These machines are all unique and they’re all really awesome. Now, let’s get this party started and head into our reviews! 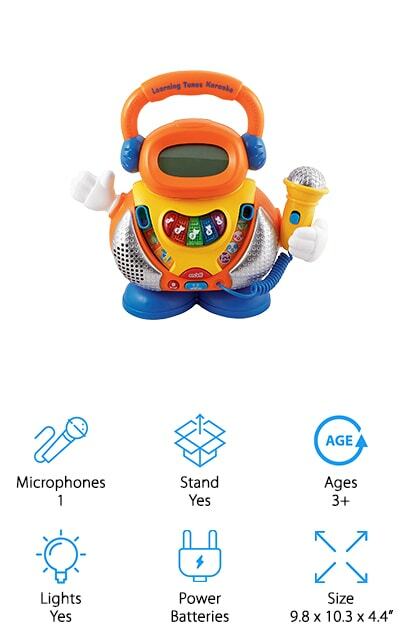 Our top pick for best kids’ karaoke machine is the adorable little robot that is the VTech Learning Tunes Karaoke Machine. The robot’s digital face even changes its expression to go along with the current music. It comes with 15 different karaoke songs ready to go. Your child will get a kick out of the different voice changing effects. (Let’s be honest, you will, too!) They can change the tone from their normal voice to a man’s voice, robot voice, and an echo effect. That’s not all, there are also different educational play modes, including songs about letters and numbers and some just for fun, too. There are 15 different songs in all. This toy is meant for younger kids around age 3. 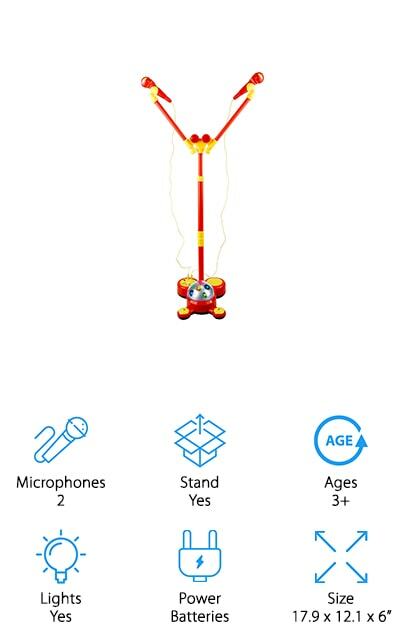 There’s 1 microphone and the batteries are included. 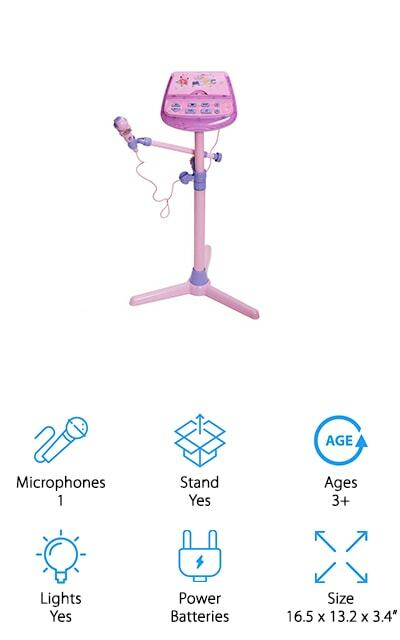 Next up is our budget pick for best kid friendly karaoke machine, Little Pretender Karaoke. One of the cool things about this karaoke machine is that the stand is adjustable. It actually adjusts from 18.5 inches all the way to 40 inches when fully extended. That’s good because it can grow with your child. You get 2 microphones with this machine, one for the stand and one that’s hand held. We love that you can hook this one up to your devices so your kids can sing along to their favorite songs. The dancing pedals are a nice touch. When stepped on, they cheer on your child to keep the party going. And we can’t forget to mention the multi colored stage lights that twinkle while your little superstar is singing. 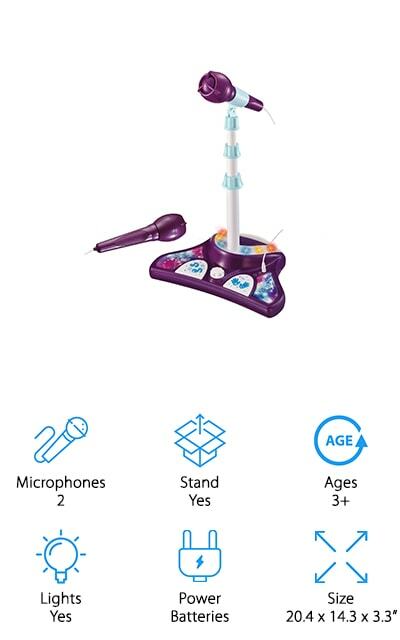 Number 3 is the best karaoke machine for kids who like Frozen. Disney’s Frozen Karaoke Machine is pretty awesome. For one thing, you can set it up so you can read the lyrics right from your television screen. Or you can use the included CD and lyric booklet if you prefer. 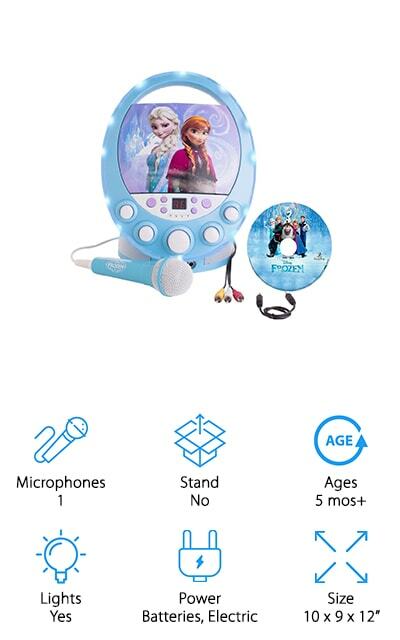 Music and lyrics from 2 of the movie’s most popular songs are included, “Do You Want to Build a Snowman” and “Let It Go.” We really like that it has a power adapter but that you can use batteries, too. It’s really nice to have the option to be portable when you need to and plug in again to save battery life whenever you can. Flashing lights add to the experience and make your little one feel like a superstar while performing. The Singing Machine Karaoke Player just looks like a good time. There are 2 different color options, blue and pink. Both have bright lights with a disco strobe effect that will only enhance your little one’s performance. It comes with 1 microphone, though there’s an extra jack if you have another one and want to get in on the action. Each microphone jack even has its own volume control. Plus, you can tweak the echo and balance. Listen to music on your devices using an AUX cable and sing along to your child’s favorite songs. Or you can always just pop a CD into the vertical player, too. This machine comes with an AC adapter but if you want more portability, you can use 8 C batteries to power it instead. 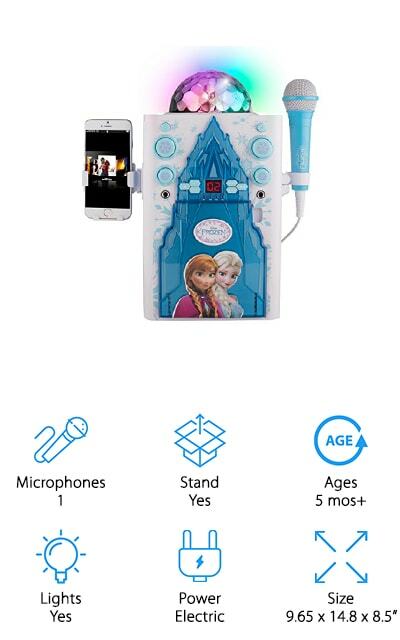 Another choice for best children's karaoke machine for Frozen fans, the Sakar Frozen Karaoke Machine feature Anna and Elsa on an ice castle themed karaoke machine. We really love the disco ball on the top, it adds a lot of twinkles and fun to the show. With this karaoke machine, you get 1 microphone but there is an extra jack if you want to add a second. It’s compatible with CDs and also has a dock where you can put your smartphone when you connect it to the machine using an AUX cable. That way, you can play and sing along to whatever songs you choose. You can set it up so the lyrics stream on your television in case mom or dad needs help singing along with their little ones. The best karaoke for kids who love Trolls is, well, this Trolls Karaoke Machine. Featuring Poppy, Branch, and Cooper from the popular movie, this machine will get you singing and dancing like you’re at a Bergen-free party. It includes a CDG disk with a few songs from the movie: Get Back Up Again, Move Your Feet, and True Colors. You can also connect it to your television to read the lyrics and sing along. Another option is to plug in your music device so you can sing along to any song you choose! There’s more. Flashing lights help make you the life of the party or plug in a second microphone and share the spotlight with a friend. You can use the included AC adapter or 8 C batteries to make it portable. 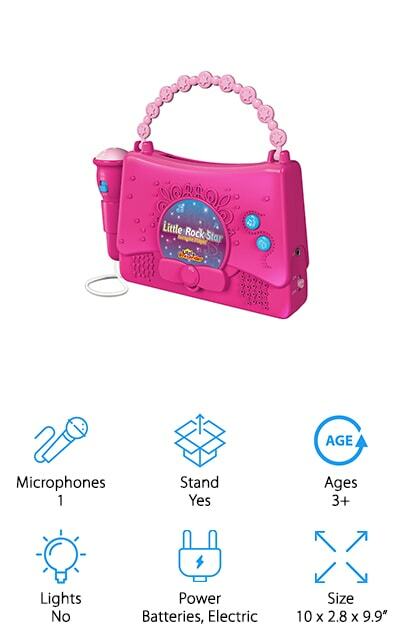 What’s special about the Little Rock Star Karaoke machine is that it’s designed so your little one can carry it around. The machine itself is lightweight and compact and it has a strong handle so it can travel just about anywhere. It comes with 10 pre-programmed songs but you can also use the included AUX able to hook up your music device and sing along to any song you want. Not only can your little one express themselves through singing but with just the push of a button, they’ll hear applause and a cheering crowd to keep them motivated and encouraged. This is a child-friendly design in more ways than one. In addition to being the perfect size and weight, it’s also made of high-quality materials that are durable and tough. 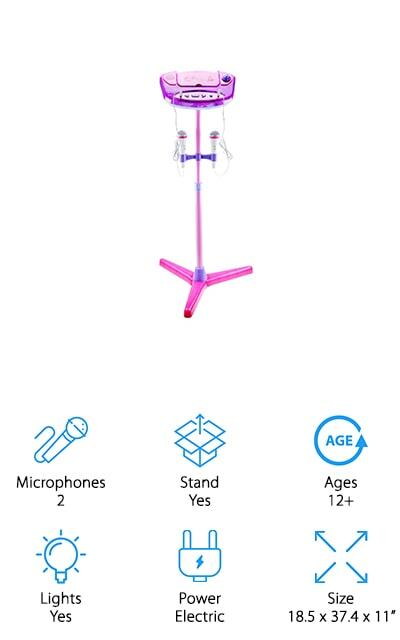 The best kids karaoke machine for sale that can adjust to the height of your child is this one from HANMUN. The microphone stand can be adjusted up to 30 inches high. This machine also makes it simple to pick music to play. You can simply plug in your MP3 player, phone, computer, iPad, or any other device and play from your own music collection using the included AUX cable. Or, use the pre-programmed background music to encourage your kiddos to make up their own tune. The flashing stage lights add even more entertainment for both the little performers and the parents in the audience. The speaker has a volume control, always an important feature of a kid’s toy. And, finally, here’s a little perk for you parents - it’s easy to assemble and disassemble. This Liberty Imports Karaoke is a best cheap kids’ karaoke machine if we’ve ever seen one. This is one of the only products in our reviews that comes with 2 microphones. The stand was actually designed to hold 2 at the same time which makes this the perfect machine for duets. Plus, it adjusts to 47 inches high, an ideal height for older kids. That’s not all. You can sing along to just about any song you love. All you have to do it connect your music device with the included AUX cable. Of course, you could always just enjoy the 8 built-in dance beats and spinning disco lights. And it’s easy to let your kids know that they’re rockin’ it. A simple push of the applause button and they’ll experience the applause of an adoring crowd. 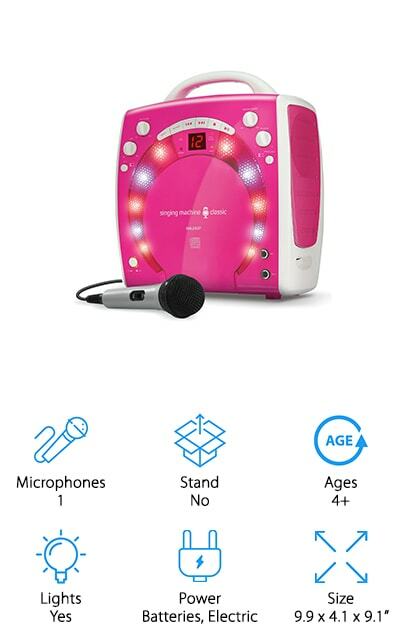 Another good karaoke machine for kids is this one from Sanmersen. It comes with 2 microphones so there will be less fighting over who gets to sing next and a lot more fun. Duets and even quartets are much easier when there are 2 mics to go around! The center panel lights up so your kids can pretend they’re putting on a big show under the spotlights. As for music, you can pretty much sing along to whatever you want. Just use the included AUX cable to connect your phone, tablet, or MP3 player and play any of your child’s favorite songs. That’s not all, there’s a built-in rechargeable battery that you can use for about 1 hour before needing to recharge. Or, you can use standard batteries if you prefer.